Dividable Grid Containers are Stackable To Save Space. Modular Containers Accept Dividers for Efficient, Organized Storage. 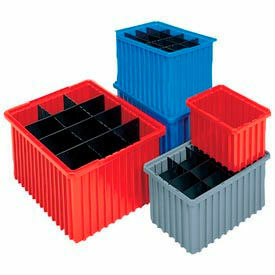 These high-density FDA approved polyethylene divider box containers are great for a variety of material handling needs including storage and shipping. 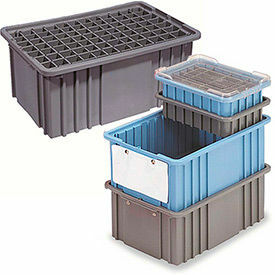 The ribbed external sides of these plastic storage boxes provide strength and withstand impacts. Divider boxes are injection molded and resist most solvents and chemicals. 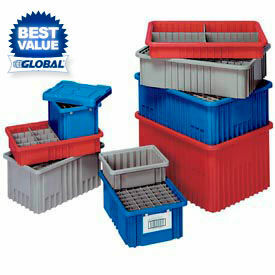 These stackable modular divider boxes stack securely with or without the optional lid (See Accessories for lids). Sold in carton quantities. Available in Blue, Gray and Red. Dividing grids sold separately. 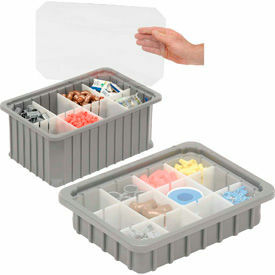 Dividers subdivide your boxes to 1-1/8" square compartments for more efficient storage. Length and Width dividers sold separately. Gray polyethylene. Sold in packages of 6.